This dual perspective book is the final installment in the Perfect Series but can be read as a stand-alone. Perfectly Misunderstood is (possibly?) 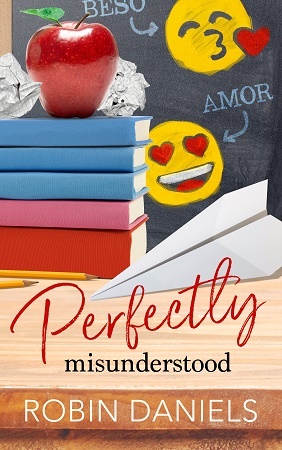 the last book in the Perfectly series by Robin Daniels. I loved this series, especially this one. Mike and Jayden are two opposites that definitely attract in this page turning read. Mike shows off as the dumb jock, but is in fact a very smart and deep guy, someone who can challenge the uptight and somewhat presumptuous Jayden. They get thrown together in an unconventional situation, developing a great friendship along the way. The banter is witty, sarcastic, and the inner thoughts had me laughing out loud throughout the book. Putting this one down was a real punishment. I loved the growth in both characters, but I would have to say that Mike was the real hero for me. He is an exceptional guy, so much more than you would ever give him credit for, and still a real man. Great to dive into his mind, and have a poke around. I enjoyed a return of the original cast (book 1), and the part they played in this story. In the other books there was a small mention here or there, this time we got to revisit them and were reminded of their fun personalities. I will miss these books, and probably return to them when I need a pick me up in the future. Loved Daniels debut series, and have high expectations for her future work. Robin Daniels is a sixteen-year-old trapped in a middle-aged body. She’s married to an amazing guy and has five cute but crazy kids. When she’s not chasing children or writing books, she’s coaching volleyball or working on her blog. She tries to read as much as possible, but often gets distracted by Netflix. Robin’s favorites include napping, dessert, pedicures, Christmas, Arizona winters, and Diet Coke. Runs the whole month of April. Winner will be selected on May first and receive signed paperback copies of all 4 books in the series, along with a $50 Amazon e-gift card. Physical copies are only available for a winner in the US. For a winner outside of the US, e-books will be substituted for paperbacks.